Born between October 24th and November 22nd and known to be Passionate, Determined and Magnetic. The Scorpios of the world are great to be around and an inspiration to the people who look up to them. They’re seekers of truth who will stop at nothing to discover the real story behind something. This passion and drive transitions well into the relationships they have with friends and coworkers as well. Fearless leaders and true friends, who will never betray your trust or spill your secrets, Scorpios are a water sign you can count on to fiercely defend the people and things which are most dear to them. 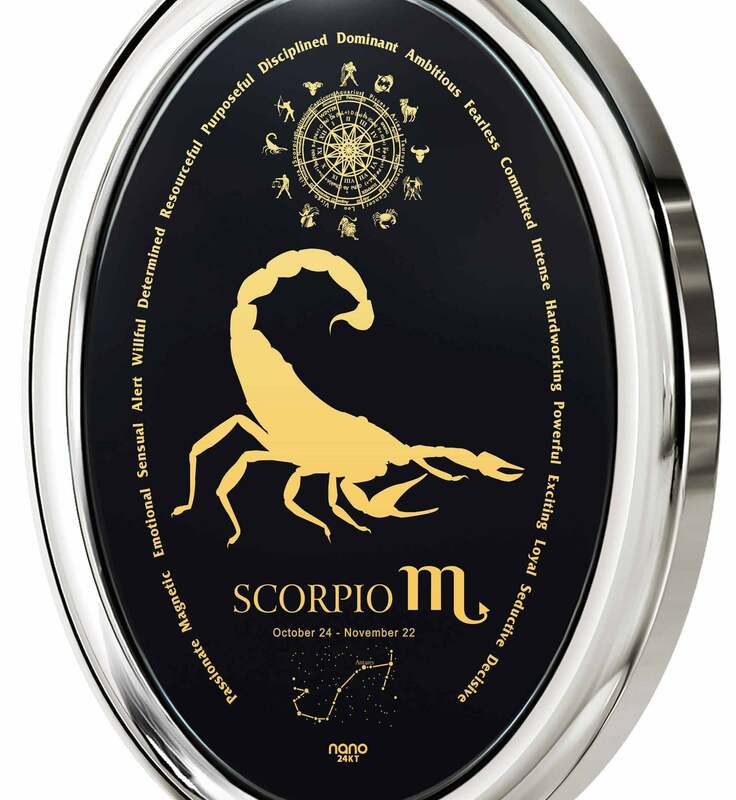 A Scorpio’s personality is magnetic – they approach almost everything they do in life with tireless passion and vigor, inspiring the people around them to give it their all as well. 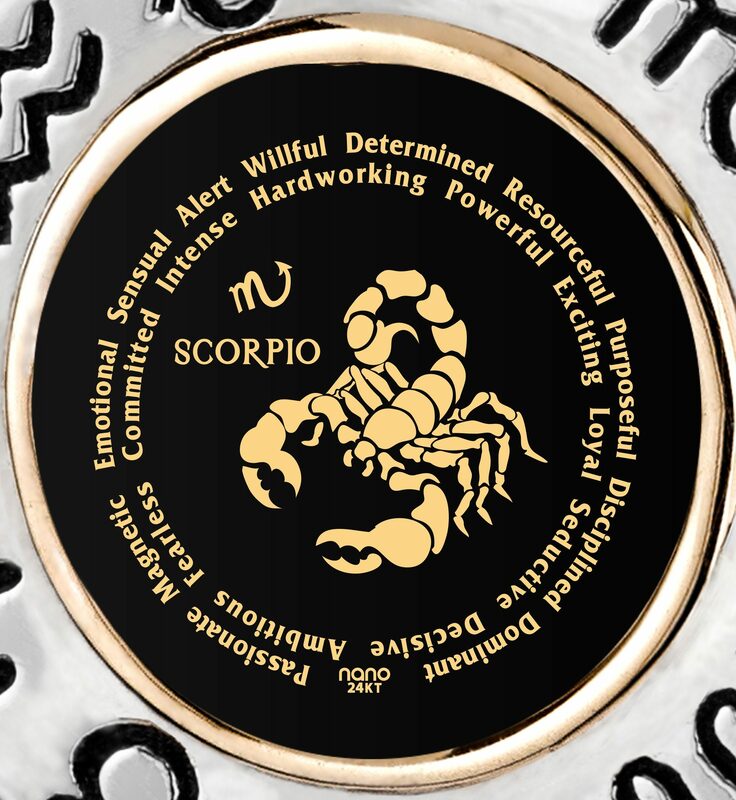 How many times has a Scorpio you know and love urged you on to push your boundaries, either at work, when pursuing your dreams, or in the gym? 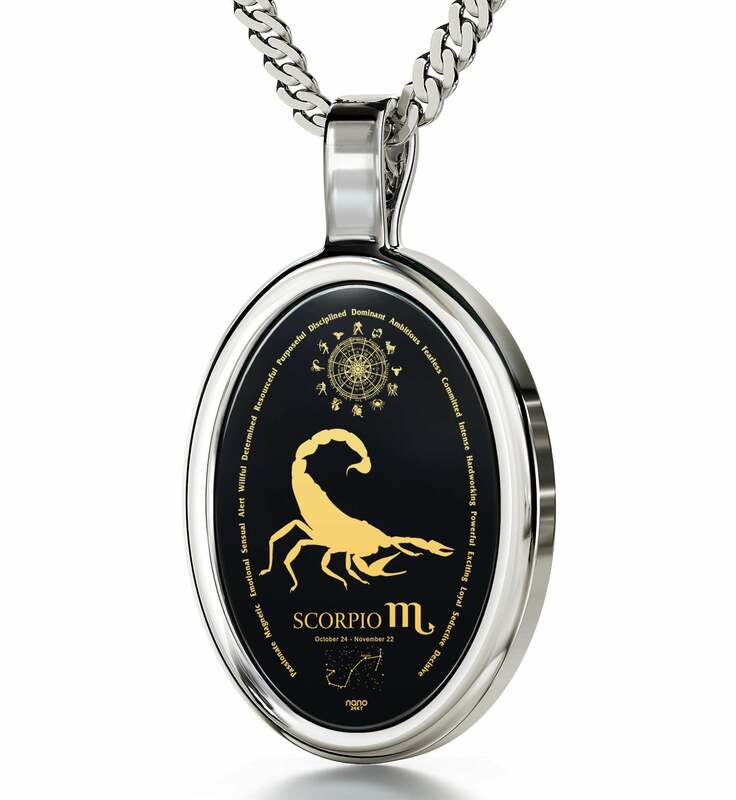 If you’ve been having trouble expressing gratitude and thanks for some of the things a person born under this sign helped you with or inspired you to do, then a Scorpio necklace from this breathtaking collection would be something she definitely wouldn’t scoff at, even having the potential to become a worthy gift for the woman who has everything! 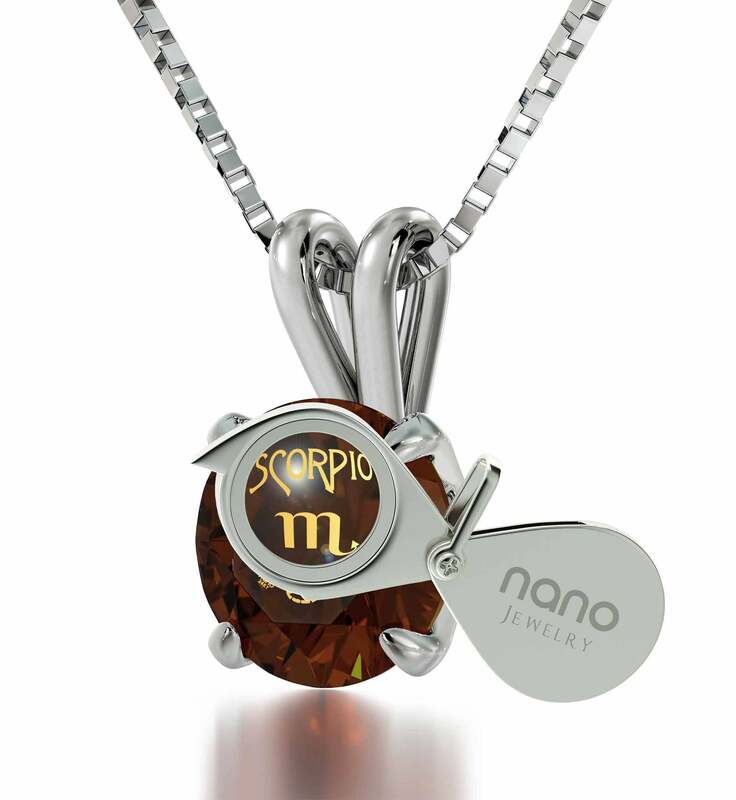 Welcome to Nano Jewelry’s dedicated Scorpio collection! In it the intense and ambitious personality of this star sign is honored with exceptional necklaces that are every bit as interesting as the person who will end up wearing one around her neck. One of the dainty necklaces on offer in it is probably among the best birthday gifts for her or him imaginable – the necklace focuses on what helps make them the unique individual who you’re celebrating, plus we trust that you’ll agree that it looks fabulous once you’ve spent a minute or two on getting to know each version on display a little bit more. The collection is also part of a larger whole – It would have been silly of us not to prepare delightful jewelry in honor of the other 11 zodiac signs, so feel free to peruse our Taurus necklaces or Aries jewelry as well to discover amazing gifts for even more of your loved ones! Other than being representations of the grand tapestry of constellations that brighten up the night sky and guide our lives in unseen ways, you’ll find that the gifts for sisters, wives and girlfriends strewn across these insightful collections have one more meaningful thing in common. It is a hallmark that essentially makes them stand above similar jewelry items and is an integral part of what they are – unique presents with character! We’re talking about their inscriptions of course! Developed to perfection inside our very own lab to be able to outlast an eternity and still retain all of their golden glory, they’re pure golden miniature artworks as detailed as today’s standards allow. We’ve got the knowhow to create romantic gifts for girlfriend others can only dream about! Take this absolutely stunning, diamond-studded golden necklace as an example of a birthday present for wife that ought to shake her up down to her very core. 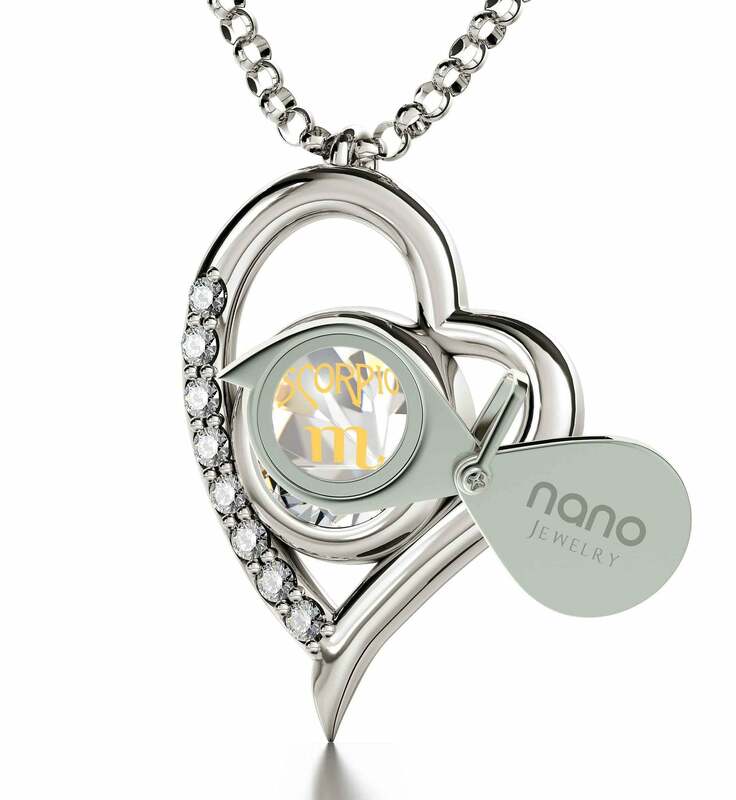 Observant as she is, she’ll notice the craftsmanship that’s gone into arranging the eight petite diamonds with the necklace’s grand Swarovski crystal right away. If you balance the delicate golden frame out with a colorful version of the stone like opalite, her genuine happiness will be all the greater. Your sibling is sure to appreciate an extravagant present like this as well, so as a special gift for sisters, we’ve made it available in sophisticated silver. Now here’s an unusual gift for women whose design she couldn’t have encountered anywhere else. 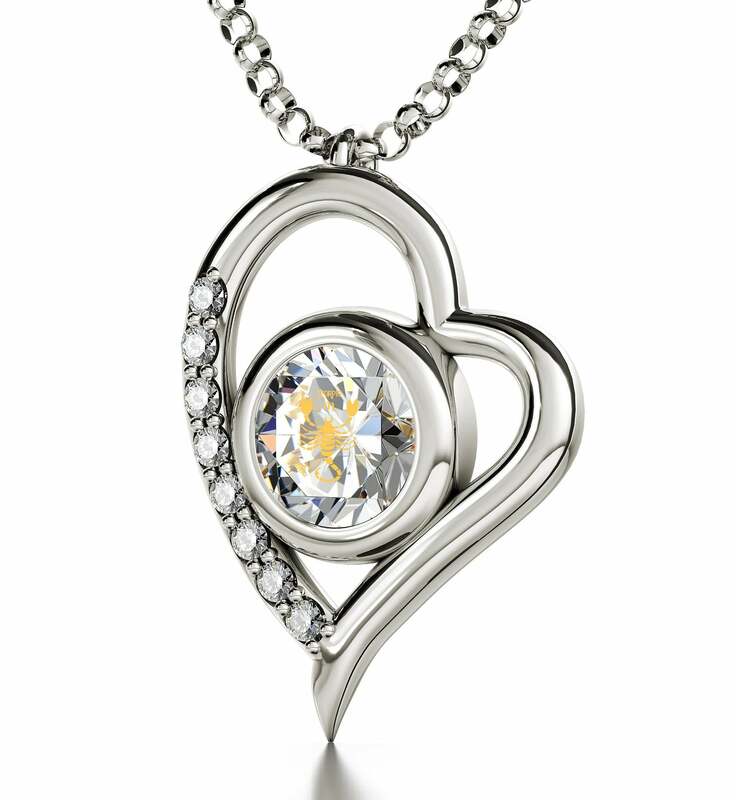 It’s delightful to see how two simplistic curved white gold outlines curve around a masterfully cut Swarovski gem to create a mesmerizing eye staring right back at anyone who beholds its sublime beauty. Secured around her neck with an elegant rolo chain, this great gift for her will likely accompany your sweetheart on many an eventful journey. 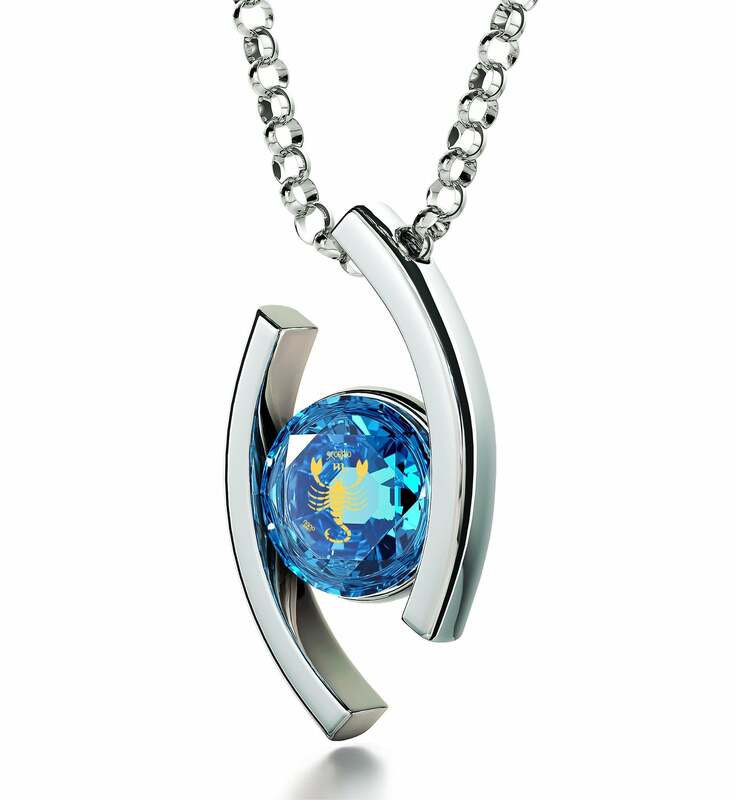 You can stop wondering what to get girlfriend for birthday as these necklaces are creative gifts for her beyond compare. 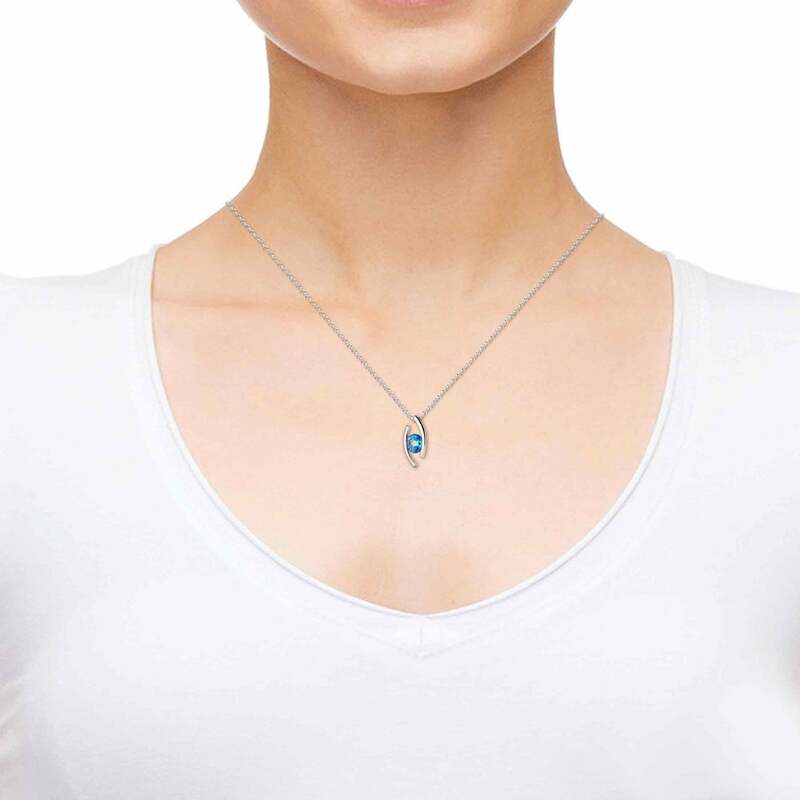 Another crowd pleaser and possibly the top gift for wife in the series is this enchanting necklace whose gem lays completely exposed and yet is safely in the clutches of a solitaire frame. 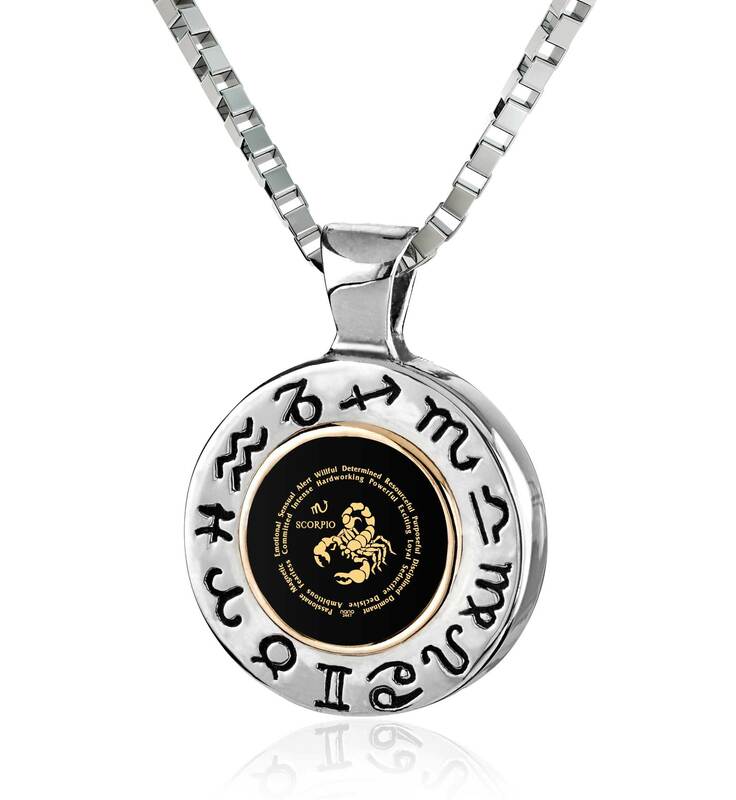 This 14k white gold necklace is a sensual and seductive little piece that will surely be to a Scorpio’s liking, after all, the Scorpio horoscope personality happens to also exhibit these desirable traits. If she prefers the alluring glow of regular yellow gold, then this fun gift for women will mean a great deal to her. The Scorpio’s never-ending quest for truth has already been mentioned, and what better truth is there to look for than knowledge about oneself? No, we won’t get all philosophical on you. Rather the last bit of Scorpio jewelry is decorated with more than just a cool image of a scorpion ready to strike – on its silky smooth onyx surface, the gold pendant for women and men alike gives them and the people who admire their new necklace a glimpse into the sign’s world, showcasing various Scorpio personality traits, their constellation and other keen tidbits that are perfect as interesting topics to break the ice with. Everyone likes to be able to make the gifts for more personal. 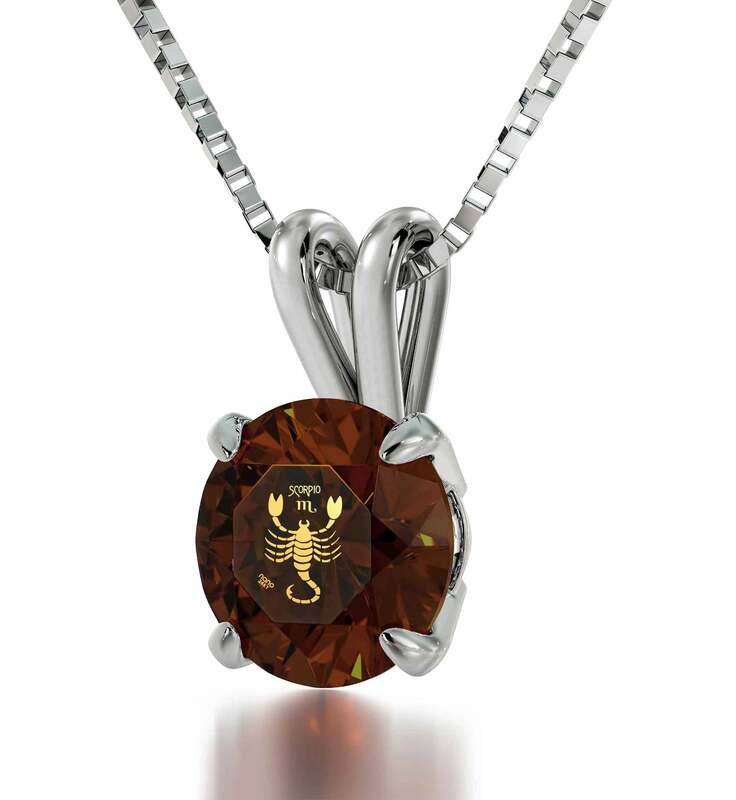 As with the rest of our jewelry, you get to choose which color the stone adorned with the scorpion bears. Unlike most of them though, a color of particular interest you should set your sights on is smoky topaz. The Scorpio is one of only a handful of themes we use this earthy and warm tone with, making a cute gift for girlfriend with it as your color of choice even more exclusive. Add to that a handy little magnifying glass each customer gets free with their purchase, and you’ve got quite the girlfriend birthday idea or wife present to wow her with.